You don't need chainring spacers. Your chainline is perfect. However, let's pretend, just for a second, that you have this... friend whose chainline isn't quite right. If your friend puts a set of these between ring and spider, they can move their ring a little, hopefully enough to shift it into the plane of the cog and correct the misalignment that's bothering you, ahem, them... Sets of five. They sell too-cool-for-skool track bits, here. 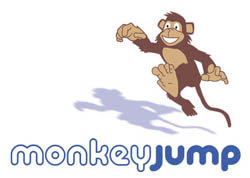 There's Monkeyjump, with it's practical Manifesto. It hasn't been updated in while, I think, but the pathos, ethos, and logos still stand up just fine. We've got the Stokemonkey and the Big Dummy, both now in production, that will carry us safely into the twenty-first century. The Stokemonkey is clearly a pure breed, coming by way of the Cleverchimp, and while the Big Dummy is not explicitly monkey, its uncle, Karate Monkey, reveals a clear connection. And we have MonkeyElectric, who have made some LED lights that we knew would come along eventually, and are really excited about. A good monkey has got to be seen. If you've been monkeying around, engaging in, or just know about monkey business, be sure to let us know. Maybe we should have a monkey-mass. Everyone should have one, don't you think? This is the Year of the Chaingaurd. SKS sent out a press release yesterday introducing their new chaingaurd, called the Chainboard. They say it looks good, but I disagree. They also say it works well, and this I have no reason to doubt--I've been universally pleased with the design and durability of the SKS products I've used. 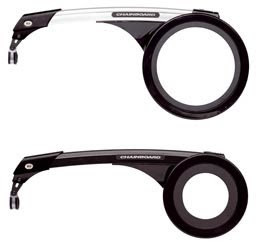 The Chainboard features the same black or silver Chromoplastic used in SKS fenders, and has a telescoping tail-end to fit a variety of bikes. It's available in several diameters in order to accomodate various derailleur configurations and chainring sizes. Ask for it at your LBS, and let me know what you think. MSRP $27.99. DC bike-culture meets Mid-west marketing and Texan-size popularity... the result is a belt drive SS/FG !? If you say so. Home Builders and Environmentalists are on the same side for a change, Hooray! I hope they did the math right... From the Los Angeles Times (full article here): "One issue everyone has been afraid to touch is land use," Steinberg says. 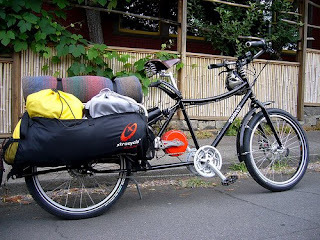 "Everyone understands about using alternative fuel. But land use has been the third rail. AB 32 changed the equation because now land use has to be part of the solution to global warming. You can't meet our goal just with alternative fuels. You have to reduce the number of vehicle miles traveled. "If people are going to drive -- and they are going to drive -- we need to plan in ways to get them out of their cars faster. That means shrinking -- not the amount of housing, not economic development, not growth -- but shrinking the footprint on which that growth occurs." ...Basically the bill would work like this: Each metropolitan region would adopt a "sustainable community strategy" to encourage compact development. They'd mesh it with greenhouse emissions targets set by the California Air Resources Board, which is charged with commanding the state's fight against global warming. And this is the key part: Transportation projects that were part of the community plan would get first dibs on the annual $5 billion in transportation money disbursed by Sacramento. (Projects approved before 2010 would be funded under the current system.) Another biggie: Residential home-builders would be granted relief from much of the environmental red tape for projects within the community plan. Local governments also would be required to expedite zoning and allow the builders to actually build. "We needed to create more certainty," Manning says. He adds that builders decided they'd rather help plan the strategy for the war on global warming than just wait for the state air board to act unilaterally. Environmentalists had the same attitude.